Physiotherapy : Total Hip Replacement – Do I really need it? Surgeons often recommend that patients seek out community Physiotherapy : Total Hip Replacement services to continue with your recovery after you have had a total hip replacement (THR). You may wonder how doing extra treatment would help? – isn’t the surgery enough to correct your hip pain? What is important to remember is that the surgery does take care of the affected joint. However, there is still work to be done to get you back on your feet and back to your desired activities. The surgery involves a cut through the muscles that stabilize the hip. Also, the body has to relearn how to move and function with a new joint. •	At home, you are usually entitled to receive home care physiotherapy sessions for a few sessions. During these sessions, the physiotherapist will re-assess your ability to move and progress your exercises as able. After receiving homecare treatments, it’s then usually up to you to continue with your exercises. This includes progressing your strengthening and conditioning. However, a lot of people have difficulty doing this on their own and need help to further progress. It can be difficult to assess your own strength and safely progress your exercises. Seeking help from a Registered Physiotherapist will help with this process. It will get you back to your optimal function. The physiotherapist can assess where there are still remaining limitations. They will prescribe the necessary treatments to address the issues. Please check out this link for further information regarding Physiotherapy: Total Hip Replacement. 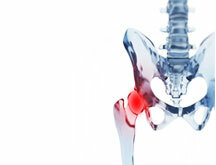 In addition, we often see patients that have had a Total Hip Replacement, develop Low Back Pain. This happens because the muscles in the hip get very tight after surgery, and tend to tighten up into the Low Back. It is also caused by increased sitting during the recovery process. The good news is that we can help! Registered Physiotherapy and Registered Massage Therapy will help these symptoms to go away. At PhysioNow, we have well trained Registered Physiotherapists and Registered Massage Therapists available to help you with your recovery. We will help to find the areas that you need in order to walk properly without an aid and get back to all the things you like to do. Call today to get started on your full recovery!